A 10 foot long great white shark, hooked by a fisherman and fighting for its life, took a bite on a distance swimmer in the waters off the Manhattan Beach Pier today. The men in the video on the Manhattan Beach Pier were illegally fishing for shark. They threw bloody chum in the water knowing it would attract sharks. The young Hispanic fishermen caught the shark and battled with it for about 40 minutes. Then they either cut the shark loose or it got loose on its own. Around this time the swimmers were nearing the pier. The group of swimmers swim each Saturday from pier to pier. They had no idea what was ahead of them. 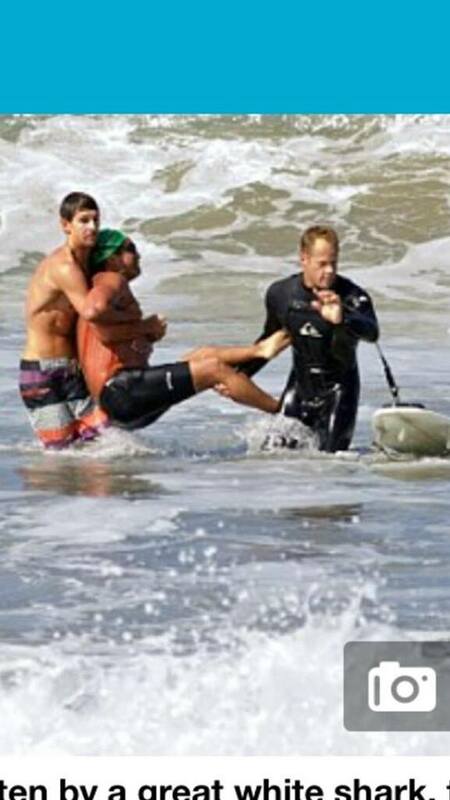 Surfer Brian Griffiths helps save swimmer Steven Robles after he was bit by the Great White shark. 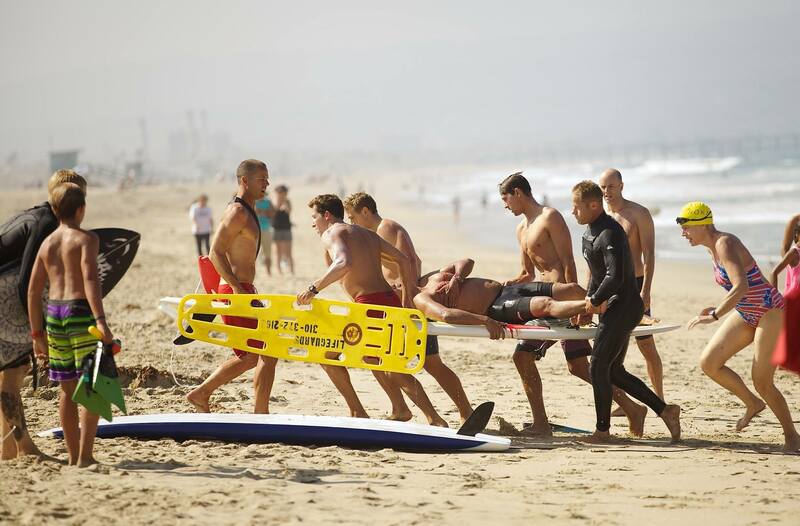 Brian uses his surfboard as a stretcher to get Robles to the ambulance. As the swimmers neared the pier the fishermen were laughing about how the shark just got loose and was heading towards the swimmers. You can hear them laughing about it on the video. They kept laughing until they finally realized that one of the swimmers had been bit. From the video: The shark — estimated by county lifeguards to be 10 feet long — bit the 40-year-old man in his upper right torso and then spat him out, said County Fire Inspector Rick Flores. The swimmer had stable life signs and moderate injuries, and was bleeding but conscious and talking to paramedics as he was loaded into an ambulance among weekend beachgoers on The Strand just south of the pier. A popular stretch of beach one mile north and south of the pier was closed to swimming, as a county helicopter ordered people out of the 69-degree water on a holiday weekend. It was reopened shortly after 3 p.m.